TheSmokingGun.com is funny, and we're geeks and sometimes we come across things on sites, blogs, and other journalistic endeavors that we are compelled to share with you. 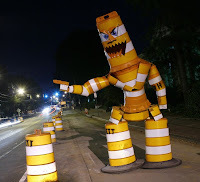 The fellow who made the Orange Barrel Monster, was arrested, charged with a misdemeanor for destroying the orange construction barrels that belonged to a private company. Hell, the publicity they have gotten and are going to get, is probably going to be worth the aggravation. Rodney Carrington, great comedian, really, wrote a song, works a little too well with the photo. Enjoy!